Exeter-based Lightfoot has been awarded a £1.8 million Government funded project to help cut harmful air pollution through “Connected Car” technology that rewards better drivers. The project will use Lightfoot’s trail-blazing in-car device to aid and reward smoother driving styles, cutting fuel bills and pollutants on the UK’s roads. The project will also see Securious, a cyber security compliance company based in the Exeter Science Park, utilising their sector-leading experience to find new and better solutions for connected car security. Awarded by Innovate UK, the grant is part of the Government’s commitment to invest in the Connected Car sector, which has been identified as one of the world’s fastest growing technology areas. The funding allows a consortium led by Lightfoot, including The Institute of Advanced Motorists, Exeter-based cyber security specialists Securious, Revolve Technologies, and the University of Bath, to develop connected transportation solutions in the near term and systems to manage communications between autonomous and traditionally driven vehicles in the longer-term. 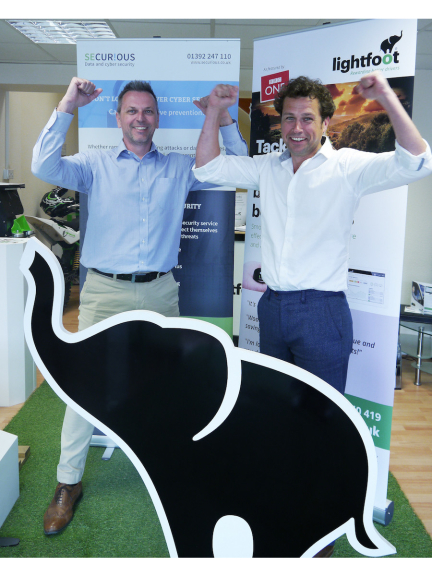 Lightfoot itself will receive almost one million pounds from the grant, cementing its position as one of the UK’s leading businesses in the global race to develop connected transportation solutions and places Exeter and the South West as a hub of national excellence. Local drivers will be recruited to test Lightfoot’s new ‘Connected Car’ solutions, making Exeter a UK hub for the development of this exciting new technology. The funding is one of 38 automotive research and development projects to receive a share of £109 million announced by the business secretary Greg Clark and transport minister John Hayes. The project, which commences on 01 May 2017, will allow Lightfoot to further develop its award-winning connected car technology, enabling drivers to be rewarded for smoother, more efficient driving while benefiting the wider environment; Lightfoot is proven to reduce CO2 emissions by 10-20%, nitrous oxide (NOX) emissions by 20% and particulates by 15%. It has also been shown to reduce accidents on the road with up to a 75% reduction in total claims values. Under the project Lightfoot will deliver its groundbreaking “Driver Ecosystem”, which rewards smoother, safer and more efficient drivers with discounts on breakdown cover, car servicing and maintenance, car insurance, car finance, car rental, and much more. There’ll even be discounts for Lightfoot drivers in technology outlets, cinemas, restaurants, and coffee chains. Commenting on the funding Mark Roberts, Managing Director of Lightfoot, said: “The Government grant is a huge endorsement for our technology. We’ve found the key to instantly and consistently cutting pollution on the roads by combining rewards for better driving with connected car technology. Now drivers can adapt their driving based on real-time feedback from the engine and get great rewards for being smoother drivers. It’s the ‘Fitbit for cars’ that’s fun, social and addictive, delivering cleaner, greener and cheaper motoring for all. “Our next goal is to take this technology global, getting as many of the billion plus vehicles on the planet to be driven as efficiently as possible. Through the government grant and our work to advance connected car technology, we believe that this ambition is possible. Picture shows (left to right): Director of Securious, Pete Woodward and Mark Roberts, Managing Director of Lightfoot.